What are Mycoplasmas? | Bionique® Testing Laboratories, Inc. Figure 1a - A common feature is the variability in cell morphology related to the absence of a cell wall. 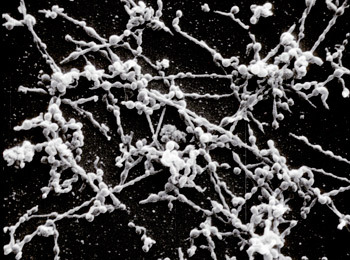 SEM of mycoplasma filaments - Image courtesy of Dr. Michael Gabridge (Figure 1a). It is considered to be the smallest free- living organisms capable of self replication with a genome in the range of only 600-2200 kb. Mycoplasmas have become one of the most prevalent and serious microbial contaminants within cell culture systems used in research and industry today. Characteristically, they can achieve very high densities in cell cultures (107 to 108 organisms/mL) without any visible changes to medium pH or turbidity. They can be grown on artificial media, but most species require very complex, nutritionally enriched media and carefully defined environmental conditions. Some strains are considered to be non-cultivable and therefore, cannot be detected by direct culture methods. There are currently more than 183 species in 8 genera, many of which are pathogenic (The Manual of Clinical Microbiology, 2003). The vast majority of cell culture contaminants belong to only 6 species primarily of human, bovine or porcine origin (Table 1a). Of these six species, M. orale and M. hyorhinis are the most common historically, accounting for over 50% of all mycoplasma contaminated cultures (Del Giudice and Gardella, 1984; McGarrity et al., 1979; Barile et al., 1973). See Table 5a for more information on the prevalence of individual species in cultures. Figure 1b - Fetal bovine serum and antibiotics in cell culture media have played important roles in the spread of mycoplasma contamination.recognized as a major culture contaminant by the 1960s. Published mycoplasma test results for cell lines during this time demonstrated rates of mycoplasma contamination between 57 to 92% (summarized in Barile, 1973). This problem had its roots in two of the "advances" that were made in cell culture during the 1950s and 1960s (Figure 1b). First was the addition of the antibiotics penicillin and streptomycin to cell culture media. Developed in the 1940s, these two antibiotics were quickly adapted for cell culture making it easier for researchers to grow cell cultures long-term without losses due to bacterial contamination. However, since these antibiotics had little or no effect on mycoplasma, their use allowed mycoplasma to grow undetected in cultures. By the 1970s, Barile showed that cultures routinely grown in antibiotics had a 10-fold higher mycoplasma contamination rate (72%) than cultures grown without antibiotics (7%)(Barile, 1973). Understanding the role antibiotics play in mycoplasma contamination is critical to preventing this problem. This is discussed in greater detail in the FAQs: Why do mycoplasma contamination rates continue to remain high? and Why does overuse of antibiotics result in higher mycoplasma contamination rates? The second "advance" was the gradual switch from human and horse sera as traditional media supplements to commercially prepared fetal bovine serum in the 1960s. 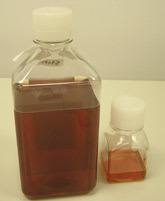 Fetal bovine serum, while more expensive, proved to be a better media supplement and quickly became popular. While human and horse sera were usually obtained aseptically by venipuncture from healthy volunteers or animals, fetal bovine serum was prepared from blood obtained in the slaughter houses under less than ideal conditions. The serum was then "sterilized" using 0.2 µm pore membrane filters (commercialized in the 1950's) to remove any microbial contaminants. Unfortunately, these filters were insufficient in the removal of all mycoplasmas from the final product. The inherent small size and flexibility of the mycoplasma enabled penetration of these filters. Complicating matters, past methods for mycoplasma testing of commercial sera usually failed to detect the low titers of mycoplasma that remained. This resulted in many cell cultures becoming contaminated with mycoplasma without end users being aware of the problem. In the early 1970's, Barile and Kern described a much more sensitive method for the isolation of mycoplasma from bovine sera. The primary change in the methodology was the larger sera inoculum of 25 mL or more in a broth medium. Testing data presented by Barile found 66 out of 238 (27.7%) commercially prepared lots of fetal bovine sera were contaminated with mycoplasma (Barile 1973). By the 1980's, serum suppliers were using serial filtration with 0.1 µm pore rated membrane filters and testing final product with the Large Volume Barile Method. Today, as a result of these improvements and other process refinements, sera and media obtained from reputable manufacturers are rarely the source of mycoplasma contamination. Recent analysis of 10,000 consecutive samples of sera, media and other bioproduct samples submitted for the Large Volume Barile Method for mycoplasma testing at Bionique® Testing Laboratories demonstrated a contamination rate of only 0.96% (96/10,000) (Armstrong et al., 2009). Yet studies and surveys still indicate that mycoplasma contamination remains a significant, serious problem with overall infection rates of at least 12% or more in all cell lines used in research within North America (Table 1b). Mycoplasma contamination rates are generally even higher for laboratories that lack a stringent quality control program which includes routine mycoplasma testing of their cell cultures. On a global level, published mycoplasma contamination rates in other parts of the world are even higher (Rottem and Barile, 1993). The remaining sections of these FAQs will help you better understand the problems of mycoplasma contamination within cell culture systems and how to effectively deal with these issues. If you have any questions on this material or would like to receive additional information, please call us at 518-891-2356 or contact us online to reach our technical experts at Bionique® Testing Laboratories . Table 1a. The most common mycoplasma species found in cell cultures. Table 1b. Mycoplasma contamination rates (primarily in North America). for the low contamination rate. Bionique has optimized the MycoSEQ Real-Time PCR Detection Assay for mycoplasma testing.